The Mars Express typically dedicates its time in capturing magnificent, top-down photos of Mars' surface. 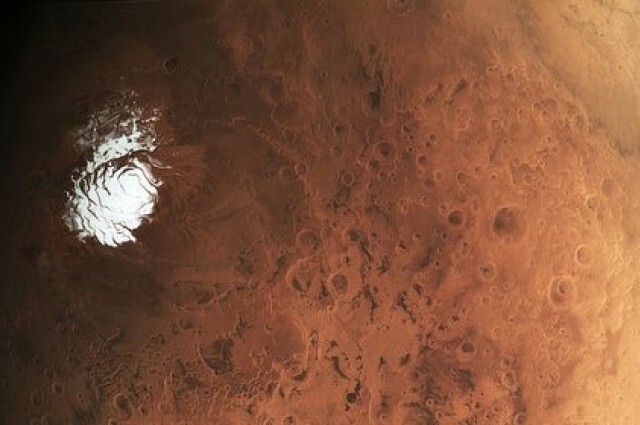 However, it decided to get the one of the most awesome image of red planet's surface, comprising the southern polar ice cap. This white patch on the surface certainly looks out of place on the dusty, red surface. This image was taken back in February 25th by the European Space Agency's Mars Express. Generally, the orbiter is placed nearly 300 kilometers (186 miles) above the surface. But, for this spectacular image the camera was positioned 9,900 kilometers (6,151 miles) above the Martian surface, which helped it to see the planet from one side to the other. There is a variety of visual enchantments to be spotted in this image, counting the frozen water and carbon dioxide ice cap in white. Shape of this ice cap changes and depends on the season, just like our own ice caps. The mid-section of the photograph covers the planet's "highlands." Several impact craters are scattered over the surface, some of them coinciding. Inside few of these impact craters are dark, dusty deposits. These are the leftovers of debris and dust that have been thrashed over the surface and have settled in the scars.Towards the top left is a minor portion of the Hellas impact basin. This basin is a huge nearly 2,200 kilometers (1,367 miles) across and goes down to a deepness of 8 kilometers (5 miles). Some of the foggy areas in the upper part of the photo are attributed to clouds. Quite different from Earth, which has an atmosphere of oxygen and nitrogen, Mars' atmosphere is composed of mainly carbon dioxide and a bit of water vapor. It's a stunning shot of the Martian surface, even though the warm colors make it easy to overlook that the average surface temperature is actually a chilly -63°C (-81°​F).